An interview by Terry Inskip. 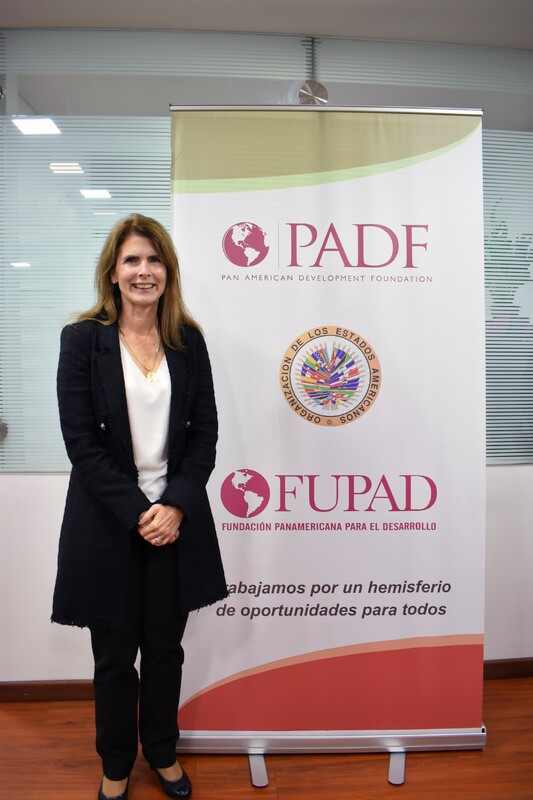 Recently I had the rare opportunity of having an interview with Katie Taylor, the new Executive Director of the Pan-American Development Foundation -PADF, a few hours before she was scheduled to travel to Colombia to work. We had the chance to talk a little about the current work of the Foundation and her vision for its future. Tell me a little about the origins of PADF and the work it does. 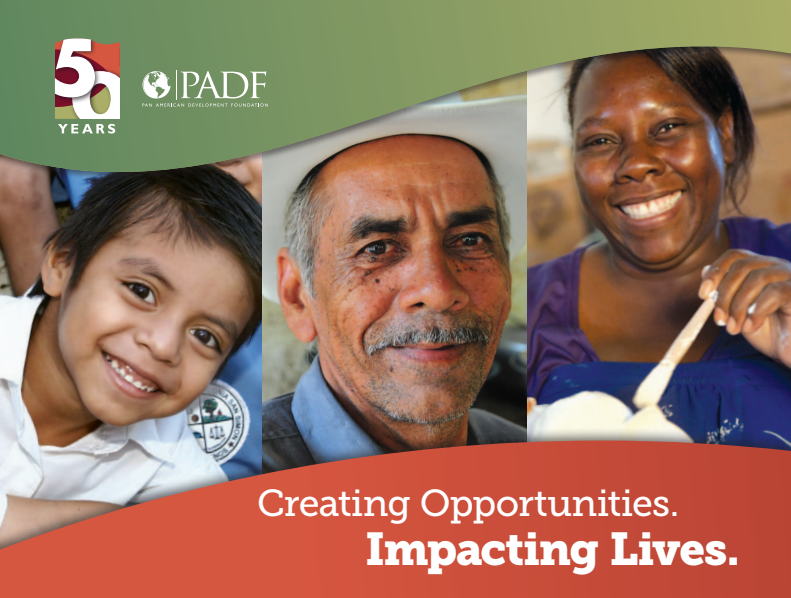 PADF started back in 1962 as part of the Alliance for Progress in the Americas, the result of the joint vision of president John F. Kennedy and the Organization of American States, that neighbors can work together to solve development issues and support the most vulnerable. Using the expression ‘a rising tide’, the idea was that if we could promote peace and development it would be good for everyone. Katie Taylor during her recent trip to Colombia. And that vision is more relevant today, if anything: even if we’ve experienced wonderful economic development over the past 55 years, there is still tremendous inequality, political turmoil, such as in Venezuela; and there are new forces at work that we had not seen vividly in the past, such as climate change and how to adapt to it, how to build resilient communities around the hemisphere and the world. I think the PADF is uniquely positioned, focused as we are on this region, Latin America and the Caribbean to have the broad view of what needs to be done; and, we’re partnered with all the right stakeholders: governments, the private sector, local, NGOs, and communities, all the stakeholders that must come together to address these complex issues in a sustainable way. Is there or are there currently any PADF projects that personally hit a nerve with you, in a good way. Something that made you feel that PADF was making a difference in the hemisphere. Definitely. There are actually several. I wouldn’t have joined the Foundation if I hadn’t been taken by it. I see this work as something that is going to engage my mind, soul and heart, and there are several projects right now that do that. One is literally in our back yard. I’m referring to the disaster in Puerto Rico. We have a grant from PepsiCo to do recovery and reconstruction, and part of the work that I’ve gotten personally involved with is trying to figure out what is going on, on the island, and to figure out how we can be most helpful. Not just on immediate response, where a lot of people have jumped in, but on the reforms needed partners for reconstruction, so that the island can be remade better than it was before. This is an aspirational vision of mine. And, of course, while Puerto Rico has three and a half million people, and is one of the largest islands hit, let’s not forget about the people of Antigua and Barbuda, or the people of Dominica, or the people in Mexico affected by the earthquakes. In this “summer of disasters” it falls on us in every way to be there for people. Another project that strikes me personally is in Northern Brazil, where PADF is supporting some of the indigenous population fleeing Venezuela. The situation in Venezuela is becoming increasingly dire, and we’re providing in a small way: a school, and a clinic built in repurposed shipping containers, helping these people who so much need it, trying to remove the strain they’re placing on the local community where they are right now. Now they can receive basic primary healthcare and schooling -some of them have never been to school before, children or adults- as these people live a very heart-rending humanitarian crisis. These refugees represent a much smaller group than those fleeing into Colombia but, maybe because they are indigenous, they have not registered on the mental map, if you wish, of crisis management. This is why we work to help them. I could go on; we’re working on democracy and self-governance throughout South America, we also work with youth and local law enforcement in programs for crime prevention, to help keep youth in schools and out of gangs, by creating opportunities for them. These issues are crucial across the hemisphere, including the United States. How would you describe the Foundation’s culture? Flexible, nimble, a staff that’s incredible. I am so impressed with the people here. They go above and beyond their work descriptions, they are hard-working, committed and passionate about their work. Part of what I love already working here is the big Latino family feeling. We’re a family. Even though I’ve only been at PADF a short time, I feel adopted, people talk to me about all sorts of things. They have all sorts of traditions, like Thanksgiving lunch, and Christmas gift-giving, and dressing up for Halloween. I can’t wait to put on a costume! Can you explain the working mechanism between PADF and the OAS, its parent organization? How much involvement does the OAS Still have with the workings of the Foundation? That’s a very good question. On the one hand we are affiliates; on the other we (the Foundation) are a legally separate organization incorporated as a 501(c), a non-profit. We do not receive any budgetary funding from the OAS in terms of maintenance. They do provide us funds yearly for disaster relief that goes straight to work on the field. When we work very well with the OAS is when we need their intervening power on a national level; the convening power of the OAS allows us to tap into the resources needed from specific areas and to bring them into the workflow. It’s extremely useful, especially when it comes to matters of public policy -when dealing with issues that go across border lines-. They open doors for us, particularly as we have all the representatives of the member states right here in Washington. The current administration is making it clear that it intends to curtail the US involvement in international organisms such as NATO, the UN, the OAS and more recently, the World bank and IMF; funding is getting slashed. I understand that the Foundation’s work is different and separate, but that you do work with some of these organizations. Have the effects of this US withdrawal been felt at the Foundation’s level? Not directly. I believe, instead, that comments by public officials about -for example- our involvement in Venezuela have not helped; but at the same time, what we’re seeing in many walks of life is a public response of “let’s rely more on civil society, on NGOs, foundations, and the public sector if we can’t rely on our government partnerships”. It is the same as it’s happening in the United States. People are becoming more active in local politics and NGOs because they feel that the government won’t be there to address certain issues of social justice, or to take care of the more vulnerable. I think we are seeing a variation of that in the Caribbean and Latin America. There’s a feeling of “doing it ourselves”. 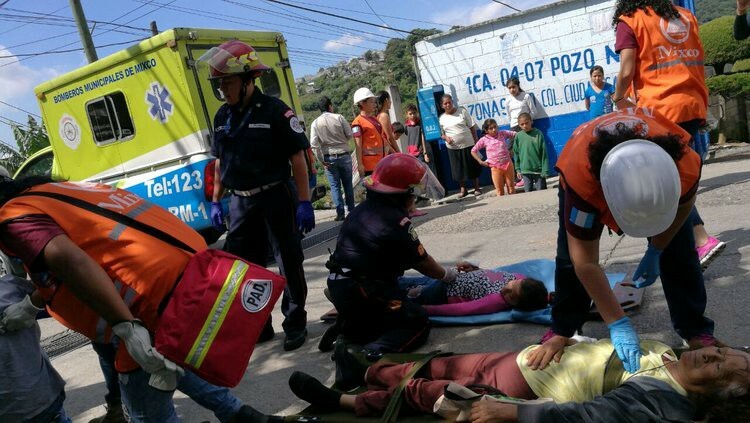 You may not know, but Mexico did not ask for any international aid after the earthquakes and yet, many private sector and NGO partners -local and international- have sprung in to help. Everyone is taking a more private approach to their national or regional problems, but we also see the private sector, among others, becoming more active in helping them. In the wake of the hurricane in Puerto Rico, we’ve seen on the media that the rescue and recovery efforts are becoming muddled. Be it for political reasons, or economic ones, Puerto Rico is not getting the help it needs. Have you seen the local, grassroots efforts pick up on some of that slack, more than they would have under ‘regular disaster circumstances’ such as with relief efforts in Antigua and Barbuda or after the hurricane in Texas? Absolutely. The Puerto Rican diaspora, especially, have become extremely re-energized; it’s been inspiring to see. But also, there are the people on the island. For instance, there’s a think-tank -people you’d never imagine getting involved- called The Center for a New Economy (CNE), whose CEO Mike Soto has been working with trusted local NGOs on the island, setting up ten distribution centers parallel to those of the government; they have small airplanes bring in small payloads. They’ve managed to move in 600,000 lbs. of food and water in the first two weeks, compared to the 1 million that the Puerto Rican government was able to provide during the same period of time. Power has been restored only to a portion of the island, maybe 40%. The remaining 60% lives in blackout conditions half the day; at night, most of the island is dark. Having no lights makes transports, communications a struggle, and we’re five weeks in after the situation started. It’s tough. The Foundation is connected with a whole network of NGOs, and we’re making sure that we all work in tandem, because together we circumvent the overlap that would take place if different people were all running around trying to help in different directions. Together we’ve been working on three areas: one is immediate relief. Also, we’re already working towards starting the growth of local food right away, to jump-start the economy (because sometimes the best relief efforts can derail an economy by providing too much and not allowing the local economy to thrive). 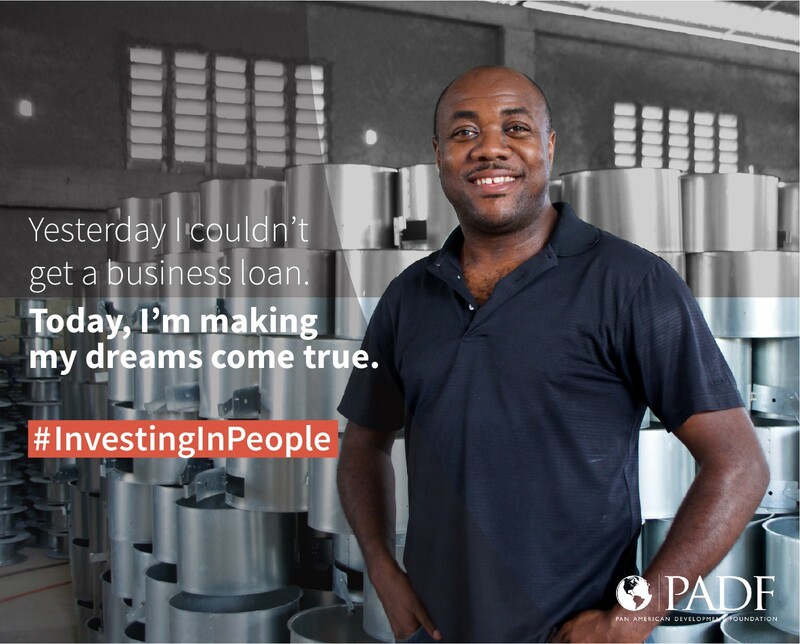 In the same manner, we have to help small and medium enterprises start back up. And then, there is long term recovery and reconstruction. Local NGOs are participating in all of this. It’s really exciting. FEMA is definitely trying, and helping, but they were not prepared for this. They’ve asked the help of USAID’s Office for Foreign Disasters Assistance, because the Puerto Rico situation is more like what OFDA has dealt with when it comes to disaster relief. Whereas FEMA are used to helping a city, that’s usually by land, with different forms of access. I don’t think that FEMA had ever dealt with the level of complete destruction that Puerto Rico represented, and being an island. They just aren’t used to that. I don’t fault them, they are dedicated public servants, and are trying very hard to do a very difficult job in Puerto Rico. One of the focus areas of PADF is Girls and Women. As a woman, you will have noticed that nowadays social media is putting a -so to speak- magnifying glass on the multi-layered monster that is women’s inequality: the glass ceiling and income disparity, harassment, sexual assault, physical and sexual abuse, child marriage, abortion laws, family honor issues, and so on. In Latin America, women’s inequality still has deeply ingrained roots in society at all levels. Do you feel that PADF is making a significant difference in reducing the problem? Do you believe that it is a focus area that could use more emphasis on areas of society that have not been considered, or that it could use a different approach that would provide a significant change on how society views women in the region? I believe that we have to look at our future -even though our funding tends to be short-termed- with a strong strategic orientation. My hypothesis, going into a strategic session with the team and the Board is that there will be two fundamental cross-cutting themes: women’s empowerment, and climate adaptation. 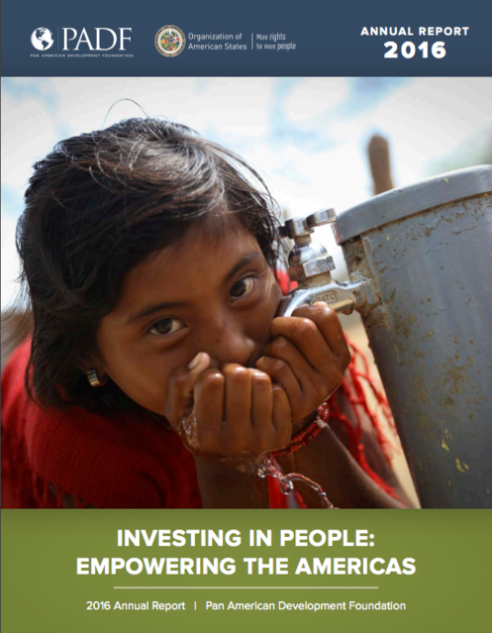 Fundamental to both of those is the long-standing way in which the Pan American Development Foundation has focused on building resilient communities. You can’t have a resilient community if the women are down-trod; if they don’t have their own livelihoods; or if they don’t have a voice. It will be half a resilient community. That’s a fundamental way of looking at this world. I’ve been looking at women’s issues for many years now; I worked on child marriage and on female genital cutting in Africa. When I worked at USAID I focused on maternal and child survival, and everything that connects to them. Now I looking forward to addressing some of the gender issues in Latin America. Compared to the participants in our programs -that is what we like to call them, ‘participants’; not beneficiaries: they are actors in their own destinies- I understand fully how privileged I am. I was the first general manager of a GE-business in Mexico years ago. I remember being the only woman at the table when the general managers all got together. I would sit down to negotiate with men who ran hospitals and healthcare centers. I was very privileged, compared to many women who have no voice. And yet, it was still a challenge for me to do that work. I can only imagine what it’s like in everyday life for the women of Latin America. These are deeply-ingrained habits that I believe that can only be overcome with a multi-sector approach work via the Pan American Development Foundation. Governments can do a lot, and must participate; but it’s incumbent upon citizens, societies, and the private sector to work on these issues in various ways. And the Foundation can bring them all to the table. The focus areas of the Foundation are many and quite broad. Is the inspiration for new projects more often found at the grassroots level, or is it prevailing that governments and corporations reach out to you? How do you find and embark in new projects? Both. In the sense that, when we’re deeply involved in the field at work, we tend to work most with communities, so as the needs of those communities crystallize, we will often understand the need for follow-up on other issues. Also, when we look at projects, typically we look at the theory of change. We ask “If we help this group of people reach this goal, what will be the next step in their developmental journey?”. There’s definitely a from the ground-up view of projects and needs. And at the same time, there’s a strong top-down approach to our work. 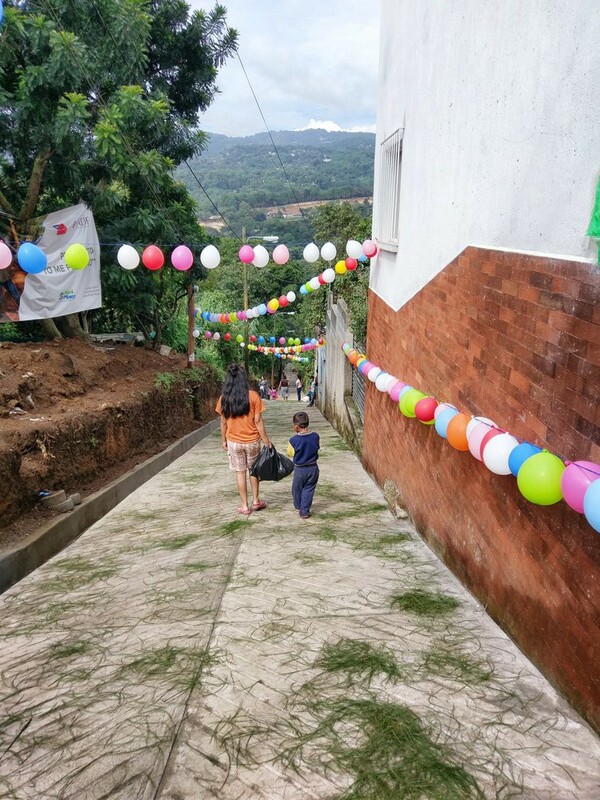 There is oftentimes a government that has a need it can’t fulfill; PADF has been doing a lot of work with the government of Colombia, for instance, during the peace process. They didn’t have the capacity to execute certain steps as fast as they needed; so, they looked for a partner, and we stepped up to the plate. I also mentioned Pepsi before. It’s often that the private sector, private businesses and corporations also want to play a role in the humanitarian/disaster relief area, or in long-term projects. One of the aspects I am working with at the Foundation, is a strategic vision for 2030. We know that we are nimble and active in our responses, and we want to continue being that way. But also, what are those strategic lenses that we want to go after -if we can find the right partner, funders, etc.- to work with? And what developmental problems are we trying to solve from a sustainable standpoint? I think that, as an organization, we could have the leverage to find many different strategic partners and bring them to the table together, to make sure that our impact is multiplied by the fact that we are all working together in this multi-sector approach. This is how I would like the Foundation to be under my leadership: providing immediate response, and working with people on projects that appear organically. In an ideal world we would like to make ourselves obsolete in this work. We’re just glad that we’re there and that there are other actors willing to work with us to provide for the vision of an equal, better future for all. It is possible. We will always have setbacks, of course, but it is possible to make a difference, even if it’s just one person at a time. Hope and optimism! Thank you, Ms. Taylor, for giving us the chance to learn a bit more about you in the midst of a very busy schedule. I hope that your work at PADF will prove as productive and fulfilling as you hope! She is the Executive Director of the Pan-American Development Foundation, an international non-profit located in the heart of DC and dedicated to sustainable socioeconomic development in the Americas. To read more about her, visit her profile at the PADF website. 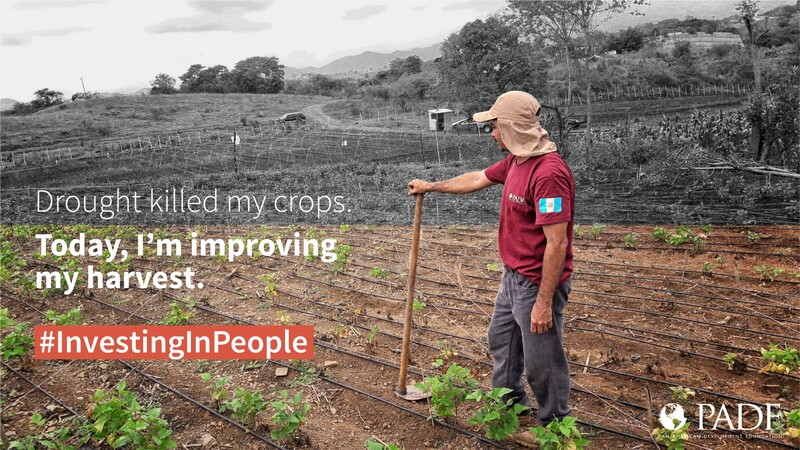 (All images in this article are courtesy of the Pan-American Development Foundation). An international Credit Union located in the heart of Washington DC. We publish to educate about money, finance, and economy. Articles written by Terry Inskip.